A multi-author blog collective is an effective way for a university or other knowledge-based institution to host discussion and debate. 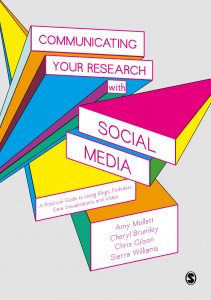 As part of a series previewing their book Communicating Your Research with Social Media, Amy Mollett, Cheryl Brumley, Chris Gilson and Sierra Williams look at how to set up an institution-based multi-author blog platform; from planning all the way to launch. Planning and launching a social science blog is no guarantee of its success. At the LSE, we have put a huge amount of thought into how our blogs are run, and our tactics and methods have adapted and changed over the past half-decade, along with trends in blogging and social media and developments in technology. There are a few ways of working common to all LSE blogs, with a few standout “dos and don’ts” from individual blogs as well. We’ll take an overall view of the process but also identify some specific examples as we explain. Possibly most important to the success of our blogs has been the planning done prior to launch. 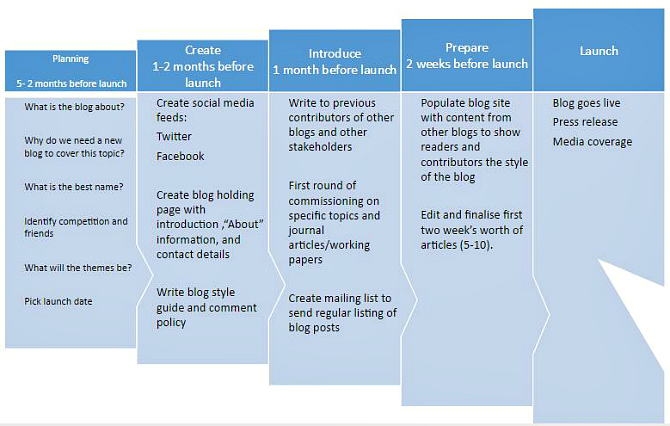 Since 2010, the LSE has launched ten public-facing blogs dedicated to research communication in one form or another, and we’ve identified five stages that each went through to get from idea to launch (Figure 1 gives an overview, below). Prior to launch, each blog was assigned a part- or full-time managing editor, responsible for all aspects of the blog’s operation; from commissioning, editing, and publishing new posts, to promoting the blog and its content via social media channels. The planning stage begins by deciding what the new blog will be about. An important part of this process is justifying the creation of a new blog. For us, this included analysis of competing offerings from other universities and online media outlets, as well as of what other blogging “friends” were doing. For each of our blogs, after discussions across our team, we felt an expert comment blog would indeed fulfil an existing need for commentary not being provided for elsewhere. Perhaps most important to this planning stage is to determine the blog’s main themes. For our blogs with a more general politics and policy focus, themes have been relatively straightforward, reflecting disciplinary areas within the social sciences such as economic policy, foreign policy, social policy, politics and elections, and judicial policy, for example. Selecting themes really sets the tone of the blog and its coverage of various important topics. It’s crucial to think carefully about these topics, and to ask colleagues both within and outside of the relevant academic fields what they feel the blog’s themes should be. It’s also worth considering how the blog’s coverage may evolve over time, depending on political, economic, and social changes, either regionally or globally. It is easier and better to set a relatively wide remit for the blog’s coverage at the outset, rather than to shoehorn in new themes to fit changed circumstances months or years later. While it may seem trivial, a blog’s name is also very important – especially when there is already a great deal of competition within that commentary space. For each of our new blogs after 2011, the team discussed potential names, whittling these down to a shortlist of two or three. We then used Google Trends to examine the number of online searches using the words comprising the proposed names, as well as double-checking each was not already in use. Rather than using a less descriptive name as others had previously (e.g. The Monkey Cage, Crooked Timber, or a pun on political science such as Ballots and Bullets, or Oxford University’s Politics InSpires) we resolved to stick to simplistic, descriptive names, such as LSE British Politics and Policy, or simple names with easy-to-Google acronyms like EUROPP (European Politics and Policy) and USAPP (or USA Politics and Policy). Such acronyms also made creating unique names for social media accounts a relatively easy task. The final part of the planning stage is to determine when the blog should launch. Are there important dates in the political calendar that a launch could be “hooked” on to? Are there dates that should be avoided as likely readers’ attentions will be focused elsewhere? In some cases, a “safe” date was chosen that was neither particularly important nor eventful, simply to launch the blog sooner rather than later. Next is creation where, around one to two months prior to launch, the managing editor registers the social media feeds and arranges for the blog to be created on the university’s blog server. At the same time a logo for the blog, as well as any header art, should be designed for feature on the site and across social media feeds. Even at this early stage, a decision should be taken on whether or not the blog is to be made publicly available. In most cases we did opt to make new blogs available at this point. When the site went live, it consisted of a static page welcoming readers and providing a short overview of intended coverage. Also provided were details of the managing editor (and any general editor), including contact information. This stage is also an opportune moment for the managing editor to create a style guide for the blog’s contributors to follow. This provides guidance on a post’s suggested word count, as well as more general information on style, what to expect of the editorial process, and likely timescales. It would also link to examples of similar writing to give contributors a firmer idea of what was required. Following the creation of a blog, typically at the launch minus one month stage, the managing editor worked to introduce the blog to the relevant community and to potential contributors. This meant collating a list of people at the institution who would be interested and possibly able to contribute. At the same time, a number of high-profile authors from the LSE and elsewhere (at home and overseas) would be identified and approached with a request to write one or more of the first tranche of posts. When selecting the first week’s posts, it’s important to keep in mind that this will be the blog’s “shop front”, and that these early posts will give people their first impression of the blog’s content – an impression that may be a lasting one. It’s important these first posts come from one or two senior academics who are supportive of the blog, and cover a range of topics that showcase the breadth of the blog’s coverage. Starting an email list of these first contacts and contributors is also a good idea, even at this early stage. There are many ways to keep readers up to speed with a blog’s output, including regular email updates. Web-based providers such as MailChimp allow users to drop content into a regular email shot and avoid the fussiness of a more traditional Word-based mail merge. MailChimp also provides statistics on open and click-through rates. In our experience, email updates can act as a touchstone for readers and a way for them to get in touch to provide feedback and even pitch ideas for new posts. The final stage prior to launch involves making sure the blog looks and works as it should, is integrated with social media feeds, and populated with interesting and engaging content. This includes settling on the structure of the blog, its menus, themes, categories, tags, and pages. Pages may include an “About” page describing the blog’s coverage and editorial team (an update of the static holding page first created when the site was made publicly available), a contributors page showcasing who has written for the blog, a page featuring your style guide, another linked to an email subscription form, and a page where readers can access a list of the blog’s themes. By this stage – two weeks or so prior to launch – there should be five to ten posts in the pipeline, with a final submission deadline of no later than one week to launch. This gives enough time for the managing editor to edit the posts and, if necessary, discuss changes with authors, clarify anything outstanding, and finalise the texts. In the two to three days before launch, the managing editor should populate social media feeds with scheduled tweets covering the first few days of operation. This is also the time to push out the blog to the institution’s communications department and other blog offerings to maximise initial exposure. The formal launch isn’t a matter of pressing a button and publishing the first posts – by this point it will already have been online for some time. The launch is about letting the world know that the new blog is now open for business. This means ensuring the university’s press office pushes details of the blog to its contacts via a press release, and that those working on the blog itself let both internal and external colleagues know it is up and running and what it will cover in its first few weeks. Despite the great deal of work involved in the lead-up to the creation of a multi-author academic blog, in our experience, an active blog works at a fairly frenetic pace, with little let-up or downtime. In the early stages, it is important to get a steady flow of contributions so there is a regular supply of posts. Depending on staffing levels, our experience has shown at least one post per day is needed to build up a sufficient number of posts to encourage readership, and to supply social media streams with a regular flow of content. Chapter 3 of the authors’ book Communicating Your Research with Social Media examines the ways knowledge workers can use academic blogging to promote their own research to wider audiences. If you’d like to purchase a copy of the book, SAGE offer a 20% discount to readers. Just enter the code is UKRM20 at the SAGE checkout. Featured image credit: Roman Bozhko, via Unsplash. This work is licensed under a CC0 1.0 license. Amy Mollett is Social Media Manager at the London School of Economics. She previously managed several blogs at LSE, including LSE Review of Books and the Impact Blog. She has published popular guides for researchers on using social media, including “Using Twitter in university research, teaching and impact activities: A guide for academics and researchers” with Patrick Dunleavy, downloaded by 100,000 readers. With her coauthors, Amy has won a Times Higher Education Award for Knowledge Exchange. Amy is a graduate of the London School of Economics and the University of Sussex, and is interested in academic communication, digital engagement, and podcasting. She tweets @amybmollett. Cheryl Brumley is senior producer at The Economist where she produces daily podcasts on economics, politics and science. Previous to The Economist, Cheryl worked for the LSE Public Policy Group for four years, producing the award winning podcast series The LSE Review of Books podcast, as well as podcasts for the LSE Impact Blog, the British Politics and Policy Blog and EUROPP. Additionally, she has worked at the BBC World Service and Monocle Radio. She is also a freelance radio journalist reporting for outlets such as Public Radio International and Deutsche Welle English. Cheryl was named a “New Voices” scholar for her achievements as a minority producer by the Association of Independents in Radio (AIR). With her coauthors, Cheryl has won a Times Higher Education Award for Knowledge Exchange. She tweets @cherylbrumley. Chris Gilson is Managing Editor of USAPP – American Politics and Policy, the blog of the LSE’s United States Centre. He also launched and managed the LSE’s British Politics and Policy blog (2010), and EUROPP – European Politics and Policy (2012), and supports the creation and management of other blogs around the LSE. He has a undergraduate and a Masters degree in Geography, and a postgraduate diploma in Strategic Management, all from the University of Waikato, Hamilton, New Zealand. With his coauthors, Chris has won a Times Higher Education Award for Knowledge Exchange. His interests include blogging, research communication, US politics, urban politics, and community activism. He tweets @chrishjgilson. Sierra Williams is Community Manager at PeerJ, the peer-reviewed open access publisher of research in the life sciences and computer science. She was formerly Managing Editor of the LSE Impact Blog. She tweets @sn_will. But in the real world, there is no money to pay any blog managers or editors. Just one person, maybe a couple, and a computer. There is also little time for academics to consult social media – I gain an hour a day by not doing so, I am sure. I take a different view based on personal experience. Blogs used to be edgy, individualistic, and somewhat random. E.g. my personal blog has no money behind it, a posting every few months, and it is an extension of academic writing that goes on across journals and other outlets. The beauty is that posts can be updated, unlike articles. They are archived, too and anybody can see them. Many academics work this way -using a blog for things that just have to be said at a certain time, with academic freedom retained, but for which they get no professional credit. The audience is quite targetted if it is introducing a new article or a nuanced point in a scholarly debate. It could be broader, for which you approach is helpful. But then, suddenly, the work of unskilled bloggers can take off too. Something I did on what it means to be a radical academic today, and another entry that is now 12,000 words long and is a guide to open access journals with no or low APCs (subverting the big 5 publishers and the rankings) – have thousands of readers. Neither of these would be very acceptable to experts in media and communication, I am sure.